In Part 1, Bill Prickett took us from his inspiration to design, introducing his magnificent Burmese python, Burma - the snake that ensures he remains single! 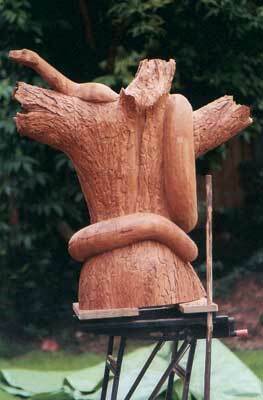 He explained how he laminated planks to create the solid piece of timber he needed for his epic sculpture, Serpent Dream. 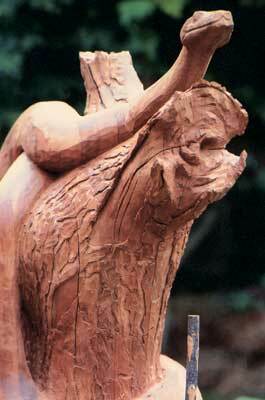 In this issue he takes us from the detailed carving to the finish. This was a nightmare - definitely worse than the snake's bite! Something I've said many times in the past is that you don't really know what something looks like, until you have had to carve it. Bark is a good example of this particular phenomenon. I have looked at trees all my life. I have spent more than ten months of my life living in rainforest, where I was always within touching distance of the nearest tree. I thought I knew exactly what bark looked like. I was wrong. When it came to the crunch, I still had to take a lump of bark from a dead ash tree back to my workshop in order to have a particular model to work from. This bark was made of quite heavily undercut, interlocking flakes much like the pieces of a jigsaw puzzle. I drew the pattern of these flakes onto the wood, trying to keep it as random and non-repeating as possible; these lines were then followed with a 6mm (1/4in) veiner. Each flake was undercut using a combination of a small rotary burr in a drill and a selection of small, cheap hand-tools that could be ground and bent to the complementary angles required. To add a bit of interest to the bark I wanted to give the impression that it was peeling away in places, especially down the centre of the back of the stump, to indicate a lightning strike. These areas had to be planned in advance, so as to leave enough depth of wood to enable the bark to appear to be lifting away from the smoother wood beneath. Similarly, at the ends of the broken branches (limbs), areas were carved to show where the bark was coming away from the wood and also where the bark had extended beyond where the wood beneath had finished. These were details that I noticed while gathering reference to show how broken stumps actually looked. Then came the most distressing part of the whole carving (for me anyway). On a perfectly sound piece of wood I had to carve splits, shakes and cracks; the very things that usually fill my nightmares. Such damage was concentrated around the broken limb ends; some running with the 'rings' of the supposed tree, some radiating out from the 'heart'. Most of the splits were carved with a scalpel blade in order to keep them thin but deep enough to lose the bottom of the cut in the shadows created by the cut. One thing I did notice was that the heart of a tree (or branch) is rarely dead centre. It looks less natural if you carve it in the middle. At this point I decided to use artistic licence. 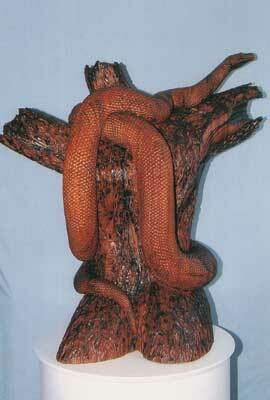 The scales of a real snake all lie very flat against the body, each one on the body overlapping the one behind. They are very thin and offer only marginal depth when viewed in relief, without colour contrast to highlight them. Each scale, if anything, bulges very slightly outwards. 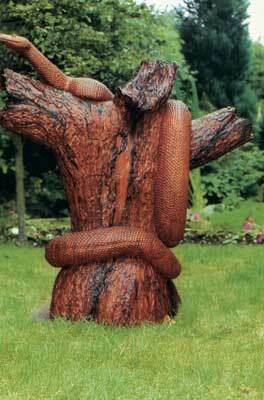 This would be very difficult (not to mention tedious, as there are 14,000 of them) to carve. So I decided to carve each scale as an individual tool mark, using a variety of different sized gouges. This would mean, of course, that each scale would be concave and not convex. I was hoping that after applying the final wax polish, the shine produced on each scale would create enough of an optical illusion to confuse an observer's brain and cause them to not give a second glance as to whether the scales are concave or convex. The scales run in lines around the body at an angle of about 45 degrees to the line of the spine. I drew pencil marks that would give me a guide to this trend and would also give me an indication of the size of the scales, depending on how close together I drew them. The scales ranged from small ones at each end to larger ones in the middle of the body and broad modified ones on the belly. The scales were carved roughly at first, to remove the bulk of the wood. This meant that with the second pass, it was an easy matter to leave clean tool marks from a single stroke of the gouge. If a scale is not carved with a single, clean sweep, it leaves lines where the blade stopped and started again and this spoils the finish. A tip when trying to produce a clean cut with a gouge is to start the cut at the far right-hand edge of the tool. Then, while pushing the tool through the wood with a good constant pressure, twist your wrist and rotate the tool (anti-clockwise) through to the far left-hand side. Make sure that you have finished the cut and exited the wood before you finish the twist, or you may well need to make another pass. Some people become a little daunted when faced with tool finishing, especially on a large piece. They think it is going to take a long time. Well, in my experience, any tooled finish will take half the time, or less, compared to a sanded finish. Luckily for me, Serpent Dream did not require a single piece of sandpaper. 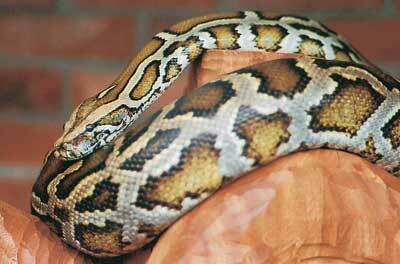 The only other detailing, apart from bark effect and snake scales, was the face, or more accurately, the eyes. Sapele takes moderate detail, so I was able to carve the eyes without fear of the eyelids flaking off. The finishing touch was a vertical slit with a V-tool to make the iris. I gave the whole sculpture three coats of Danish oil, applying it liberally with a brush and then dabbing any excess away with kitchen roll. Next I gave it a coat of Liberon finishing oil, applied in the same way. The reason for the change in oils for the final coat was more experimental than designed. It was based primarily on my personal belief that after drying for 48 hours or so, the surface left by the finishing oil is less greasy than that produced by Danish oil and so takes the final wax finish better. The completed carving was finished off with two coats of Liberon fine paste wax polish. This was applied with a stiff bristled paintbrush, allowed to dry and then buffed with a rotary brush in a hand drill. 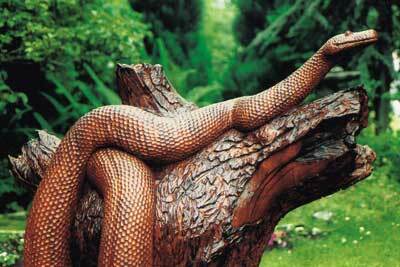 I brought the snake to a slightly higher degree of shine than the tree stump to help with the illusion of the scales. All in all I thoroughly enjoyed getting to grips with such a large project and am looking forward to tackling larger ones in the future. To anyone with an urge to realise a large sculpture of their own, I would definitely recommend experimenting with wood lamination to obtain a larger block to work from when sizeable single pieces of wood are expensive and hard to come by. "Some people become a little daunted when faced with tool finishing"
To make the tree stump look as if it had been struck by lightning I thought I'd experiment with a bit of selective burning. Using a small blowtorch - I did this outside by the way - I scorched some of the bark surface and burnt the broken limb ends a little deeper. When operating near the snake, I used a piece of tin to shield the scale-covered areas, as I didn't want them bursting into flames as well. 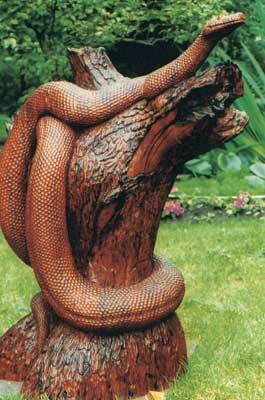 Another result of this burning effect was that it made the snake stand out from the tree stump a little more. There had been some minor plank separations during the carving process. Some may have been caused by direct sunlight at one of the carving demonstration venues, others may have been due to the way I had oriented the planks when laminating. All part of my own personal learning curve. Anyway, where any gaps had appeared I glued in small pieces of mahogany veneer, then retooled over the top. With the cosmetic repairs finished, I could seal the wood with an oil and wax combination that would reduce the chances of further shifting.